I’ve seen a lot of confusion on how to correctly create headers and footers in Activities with a ScrollView root. There’s also a lot of bad advice lying around, mostly involving RelativeLayout and resulting in headers and footers overlapping other parts of the UI when space is scarce. We’ll take a look at a better solution using the much more simple LinearLayout. Header (optional): this View‘s top will match the ScrollView‘s. 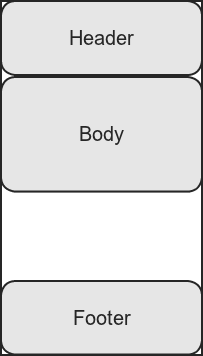 Body: this View will always be right below the header, and somewhere above the footer. Notice how, now that the screen’s size is not enough to display all of our content, the footer and the header are no longer anchored and respond to scrolling, without overlapping the body. So, how do we get there? 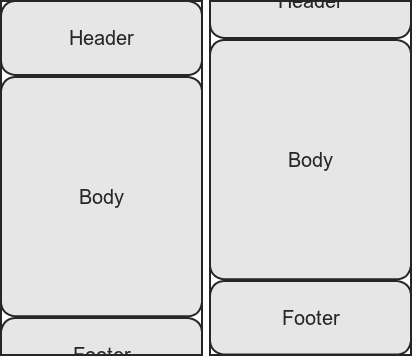 We use LinearLayout‘s layout_weight behavior to ensure that the body area will always expand to be at least as long as the remaining sandwiched space between the header and the footer. If the content’s shorter, it expands until it reaches the footer’s top; if it’s longer, it pushes the footer down. Obviously, the header and the footer can be omitted. They are not both mandatory, the same technique will work for just a header, or just a footer. If you’ve read this far, well, I hope this helped you. You are more than welcome to contact me with doubts, suggestions or corrections. This is obviously one of the ways to create header and footer with scrolling contents. But, the solution is not working if we have EditTexts in the body part. I want header and footer to stick at top and bottom respectively even if edittext is focused and keypad opens.